We have been soaking up the early days of summer here in our hometown of Montreal, which has meant lots of humidity, warm evenings with cocktails in-hand, mosquitoes that bug, fireflies that awe, old friends and new babies, and of course…poutine. 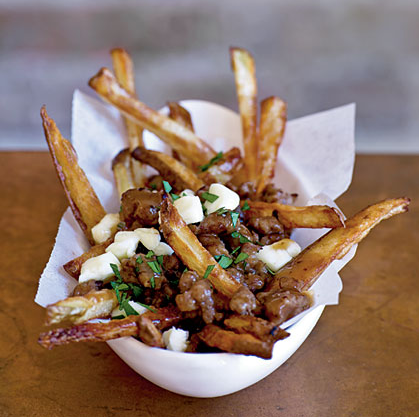 This Canadian version of chili fries is practically the national food of Quebec, a greasy, comforting combo of home-cut french fries, gravy and cheese curds. It is the junk food of every man here – the gourmand, the 5-year-old, the working man. The flavors are salty, satisfying and surprisingly welcome any time of year (though it’s particularly a must after a cold day out on the ski hills, accompanied by a beer and maybe a chocolat chaud). I keep mine simple and greasy, from local dives where they do it best (i.e. the fries are cooked in oil that has been sitting there for a while) but this more sophisticated recipe will definitely get you your fix. Happy Sunday from la belle province! *Photo by Randy Mayor, via here. a good fry is the ultimate comfort food..i have never had them with cheese curds before and i think you just changed my life.